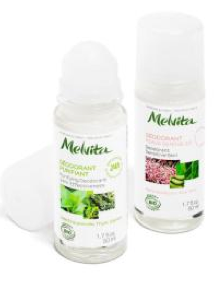 Melvita is a brand i'm sure all you are pretty familiar with, what with them being one of the main leaders in the natural and organic beauty world. They have recently announced that they are adding a few more deodorants to their collection. They currently have two deodorants in their range (Purifying Roll On Deodorant and Men's Roll On Deodorant) but this January 2014 will see the introduction of two more roll on deodorants to the line. It will be their new Natural Deodorants Collection! 24 Hour Effectiveness Deodorant - This is formulated with sage oil, triethyl citrate, acyl lactylate, Vitamin E and essential oils including Peppermint, thyme thymol and sandalwood to combat body odour and leave a lovely fragrance. The fragrance will be a floral blend of water lily, lily of the valley, rose, aloe and apricot! Also natural mineral silica is added to help absorb sweat and reduce dampness. Sensitive Skin Deodorant - This deodorants formula is a blend of usnea lichen, aloe vera, vitamin E and the all important damp busting absorbent silica! The scent of this one sounds even nicer, a sweet blend of freesia, rose, violet, vanilla and raspberry! Floral and fruity! Both formulas are designed not just to tackle both the issues of smell and dampness but also the ingredients are chosen to be non-comedogenic to keep your under arms fresh, unblocked and free to breathe. That will equal happy under arms and happy skin, helping avoid bacteria build up and dark pigmentation. Both the new deodorants are priced at £11 each for 50ml. They will be available online at the Melvita site, at Wholefoods stores, John Lewis and other online retailers and stores!